Our Abpromise guarantee covers the use of ab246002 in the following tested applications. Endogenous alpha-synuclein phosphorylation. 100 µM alpha synuclein protein monomer seeded with 10 nM alpha synuclein protein PFF (ab246002) in 25 µM Thioflavin T (PBS pH 7.4, 100 µl reaction volume) generated an increased fluorescence intensity after incubation at 37°C with shaking at 600 rpm for 24 hours. Fluorescence was measured by excitation at 450 nm and emission at 485 nm microplate reader. Active Mouse recombinant Alpha Synuclein Pre-Formed Fibrils (Type 1). Shipped on Dry Ice. Upon delivery aliquot. Store at -80°C. Avoid freeze / thaw cycle. May be involved in the regulation of dopamine release and transport. Induces fibrillization of microtubule-associated protein tau. Reduces neuronal responsiveness to various apoptotic stimuli, leading to a decreased caspase-3 activation. Expressed principally in brain but is also expressed in low concentrations in all tissues examined except in liver. Concentrated in presynaptic nerve terminals. Genetic alterations of SNCA resulting in aberrant polymerization into fibrils, are associated with several neurodegenerative diseases (synucleinopathies). SNCA fibrillar aggregates represent the major non A-beta component of Alzheimer disease amyloid plaque, and a major component of Lewy body inclusions. They are also found within Lewy body (LB)-like intraneuronal inclusions, glial inclusions and axonal spheroids in neurodegeneration with brain iron accumulation type 1. Belongs to the synuclein family. The 'non A-beta component of Alzheimer disease amyloid plaque' domain (NAC domain) is involved in fibrils formation. The middle hydrophobic region forms the core of the filaments. The C-terminus may regulate aggregation and determine the diameter of the filaments. Phosphorylated, predominantly on serine residues. Phosphorylation by CK1 appears to occur on residues distinct from the residue phosphorylated by other kinases. Phosphorylation of Ser-129 is selective and extensive in synucleinopathy lesions. In vitro, phosphorylation at Ser-129 promoted insoluble fibril formation. Phosphorylated on Tyr-125 by a PTK2B-dependent pathway upon osmotic stress. Hallmark lesions of neurodegenerative synucleinopathies contain alpha-synuclein that is modified by nitration of tyrosine residues and possibly by dityrosine cross-linking to generated stable oligomers. Ubiquitinated. The predominant conjugate is the diubiquitinated form. Acetylation at Met-1 seems to be important for proper folding and native oligomeric structure. Cytoplasm, cytosol. Membrane. Nucleus. Cell junction, synapse. Secreted. Membrane-bound in dopaminergic neurons. Primary rat hippocampal neurons (DIV16) show lewy body inclusion formation and loss of cells when treated with ab246002 at 4 µg/ml (D-F) on DVI2, but not when treated with a control (A-C). Tissue: Primary hippocampal neurons. Species: Sprague-Dawley rat. Fixation: 3% formaldehyde from PFA for 20 min. Blocker: 1:1 PBS:proprietary block and 30 mL/mL of 0.1% triton-X 100 for 30 min. Primary Antibody: Mouse anti-pSer129 Antibody (1:1000) and Rabbit anti-pSer129 (1:800) for 24 hours at 4°C. Secondary Antibody: ATTO 546 Donkey Anti-Mouse (1:700) and ATTO 488 Donkey Anti-Rabbit (1:700) for 1 hour at RT (composite green). Counterstain: Hoechst (blue) nuclear stain at 1:3000 for 1 hour at RT. Localization: Lewy body incluscions. Magnification: 20x. 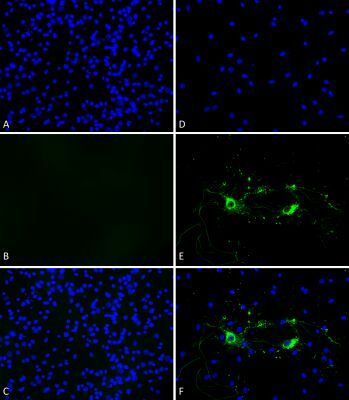 Immunohistochemistry analysis of rat brain injected with ab246002. Species: Female Sprague-Dawley Rat. Rat was injected with 2µL ab246002 in each of 2 injection sites: AP+1.6, ML+2.4, DV-4.2 from skull; and AP-1.4, ML+0.2, DV-2.8 from skull. 30 days post-injection. Fixation: Saline perfusion followed by 4% PFA fixation for 48 hrs. 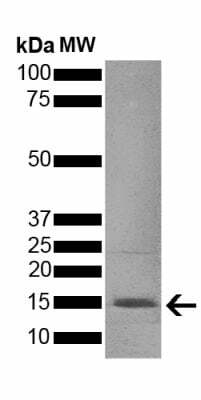 Secondary Antibody: Biotin-SP Donkey Anti-Rabbit IgG (H+L) at 1:500 for 2 hours in cold room with shaking. ABC signal amplification, DAB staining. Magnification: 20X. 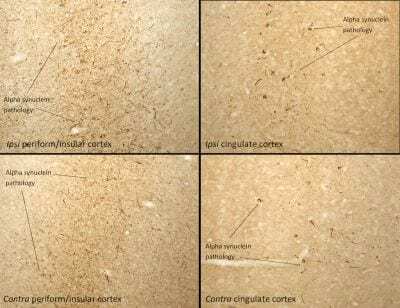 Alpha synuclein pathology is seen in the periform/insular cortex and the cingulate cortex on both the same (ipsi) and opposite (contra) sides as the injection sites. 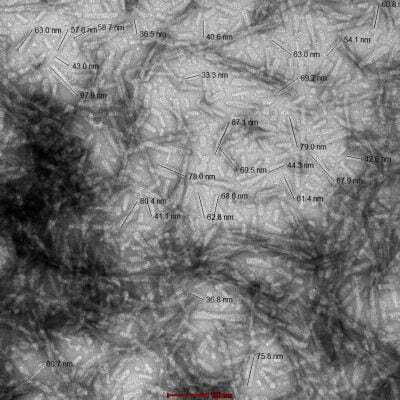 TEM of ab246002. Fibrils were sonicated and image was taken at 100kx magnification. 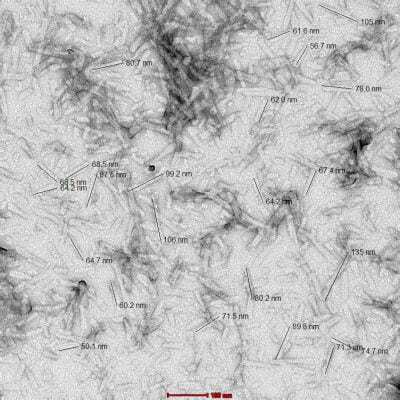 TEM of ab246002. Image was taken at 100kx magnification. ab246002 seeds the formation of new Alpha synuclein fibrils from the pool of active alpha synuclein monomers. Thioflavin T is a fluorescent dye that binds to beta sheet-rich structures, such as those in alpha synuclein fibrils. Upon binding, the emission spectrum of the dye experiences a red-shift, and increased fluorescence intensity. 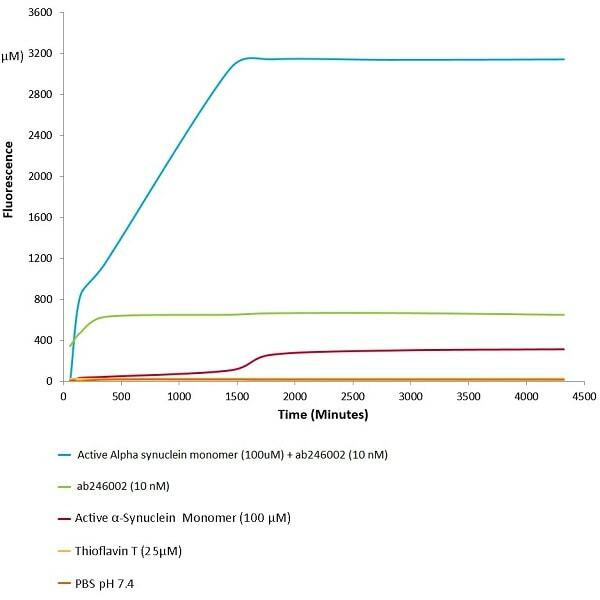 Thioflavin T emission curves show increased fluorescence (correlated to alpha synuclein protein aggregation) over time when 10 nM of ab246002 is combined with 100 µM of active Alpha synuclein monomer, as compared to ab246002 and active alpha Synuclein monomer alone. Thioflavin T ex = 450 nm, em = 485 nm. SDS-PAGE analysis of ab246002 (2 μg). ab246002 has not yet been referenced specifically in any publications. Publishing research using ab246002? Please let us know so that we can cite the reference in this datasheet. There are currently no Customer reviews or Questions for ab246002.